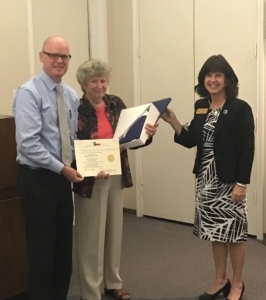 State Representative Valoree Swanson honored the memory of longtime resident and board member William “Bill” Black for his many years of service to our community at the September MUD Board meeting. Among other volunteer work, he served on the Northampton MUD board from 1999 until his death on April 25, 2017. Representative Swanson is pictured presenting his wife Mary Lou, and his son Alan, with an official resolution passed by the Texas House of Representatives honoring Bill Black and a flag flown over the Texas State Capitol in his honor on the day he passed away. Director Black will be missed by the Northampton community.